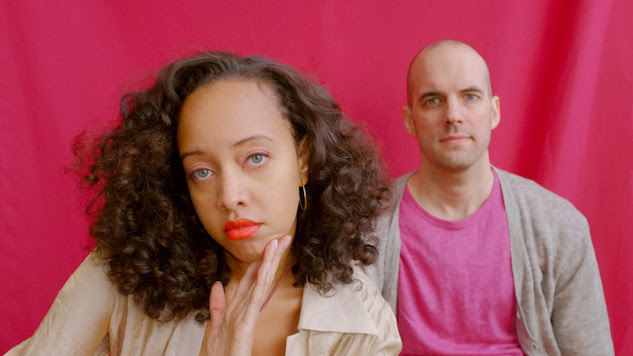 Daily Dose: Gemma, "Miss U"
Synth-pop duo Gemma have released the second single from their forthcoming album Feeling’s Not a Tempo, “Miss U.” It’s a bouncy pop tune that finds vocalist Felicia Douglass keeping her subject at arm’s length: “I might miss you but I won’t show it,” she sings over skittering drums and swelling synths. Gemma is a collaboration between Douglass and producer Erik Gundel. Douglass has previously performed in Ava Luna and the most recent Dirty Projectors lineup. Gemma’s first full-length album As Ever came out in 2015 on Inflated Records. Feeling’s Not a Tempo was recorded between Douglass and Gundel’s home studios and Gravesend Recordings. It will mark the duo’s first release on Brooklyn label Double Double Whammy, which was founded by Mike Caridi and Dave Benton of LVL UP back in 2011, and features prominent indie acts like Frankie Cosmos, Told Slant and Hovvdy. Feeling’s Not a Tempo comes out in full on May 31. Listen to “Miss U” below.